Wild Birds > Bird Feeders > Hummingbird Feeders > Blown Glass, Medium, 8-15oz. Bring a delightful look to your bird garden with the Parasol Sprinkles Mini-Blossom Chandelier. The striking curves, lasting materials, and colorful hints add a charming look to your yard with ease. Three curved arms form this dramatic frame, each culminating with a bold spiral that holds a clear glass vessel. Each of these reservoirs holds 4 ounces of nectar, and a red glass feeding flower at the top of each creates a natural dining position for hummingbirds. The red hue of each flower is enhanced by glass teardrop ornaments hanging from the metal frame, which sport blue, aqua, white, and red pieces of art glass to capture attention. These ornaments also lend striking texture to the item, for a whimsical hint in your backyard. Each vessel may be removed from its spiral holder for thorough cleaning and refilling, and their clear body keeps nectar levels easily visible. 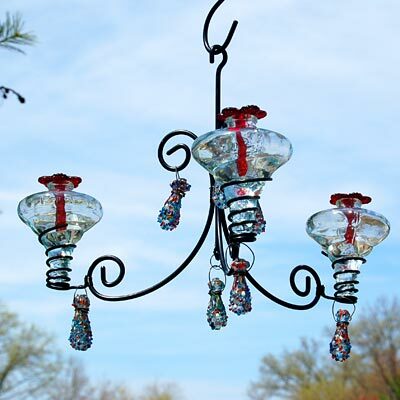 A metal loop at the top and included 2.25" long "S" hook allow the feeder to hang from a bracket easily, and the recycled glass of the reservoirs and adornments create an environmentally friendly theme. Add remarkable style to your backyard using the Sprinkles Mini-Blossom Chandelier.